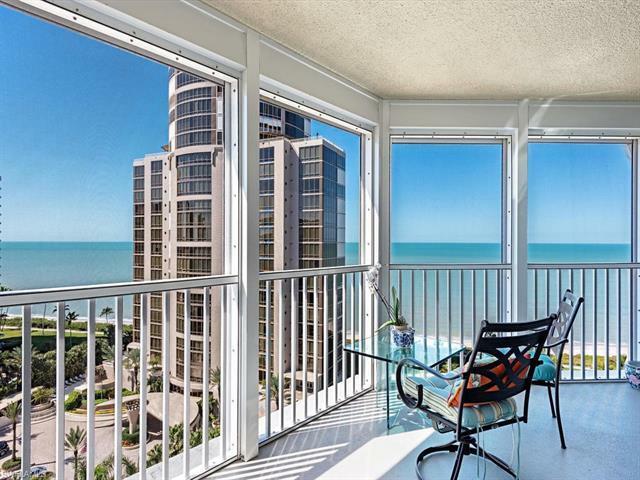 Breathtaking southwest Gulf views and dramatic sunsets will captivate you as you enter this spacious, three bedroom, three-and-a-half bath unit in the exclusive Monaco Beach Club. Electric storm shutters throughout offer security and peace of mind inside this completely protected unit. The open living room and extended dining room with panoramic Gulf views and sliders to a fabulous balcony offers a great entertainment space complete with a wet bar equipped with an ice maker, sink and cabinets. There is no shortage of storage space with a large laundry room and two additional large storage rooms. Both of the air conditioning units were installed in 2018 along with a newer hot water heater. Located just steps away from the upscale shopping and dining destination of Venetian Village, The Monaco Beach Club is one of the most highly sought after buildings along the Boulevard, boasting unsurpassed views of the Gulf of Mexico and Venetian Bay and offering a plethora of concierge services for its owners.